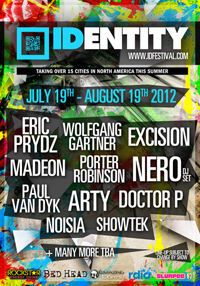 North America’s touring electronic music festival experience, Identity, will return this summer, visiting major amphitheaters in 15 cities throughout July and August. IDENTITY will kick-off in the afternoon, running through into the night, and will be centered on each venue’s central amphitheater stage. Tour stops include Boston, Atlanta, Miami, Dallas, San Francisco, San Diego, New Jersey, New York and more. Identity’s line-up features some of the most cutting-edge acts in EDM presenting them in some of America’s most storied venues, arenas that were long reserved for rock bands. Sweden’s Eric Prydz, despite huge demand, hasn’t toured the US since 2007 due to a fear of flying, but with a new album ‘Eric Prydz Presents Pryda’ out soon and a unique Identity live show, this was one road trip Prydz couldn’t miss. Paul van Dyk will also be bringing his monstrous live show and production, as will French teen sensation Madeon who will be playing in support of his debut album release, following his recent much-hyped headlining sets at Ultra and Coachella. He’ll be joined by fellow teen, Porter Robinson, fast emerging as one of dance music’s most promising young talents, who’ll be wielding his massive big room electro sound to the event’s festival-goers nationwide. Other acts include Nero, Wolfgang Gartner, Hardwell, Showtek, Excision and Noisia. A $25 All-In early-bird ticket special is available now. For more info, including tour dates, check www.IDFestival.com and http://www.facebook.com/IDFestival.